Hello! It's time another Sparkle Creations Rubber Stamps Challenge! Thanks to all of you who played along last week! Each week we will post an all new challenge at this time (9 PM PST on Mondays). For all the details, please visit the SCRS blog. 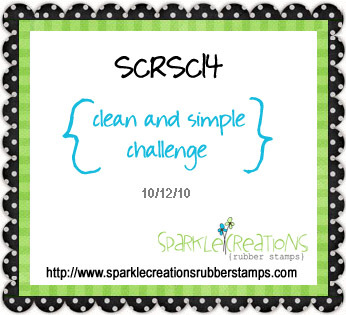 This week's challenge is CAS (Clean & Simple)! I adore all of the new images that Sparkle released, but Holiday Emily is my favorite! I just had to use her for my CAS creation today. I used my Scor-Buddy to create score lines on either side of the card, punched a border on the bottom and added my colored image in the center with some foam tape. Holiday Emily and 5 other holiday images were just released in the store.. click HERE to take a peek! Accessories: French Scroll border punch (Martha Stewart), Scor-Buddy, Markers (Copic), Christmas Red Stickles (Ranger), Foam tape, Thread, Sewing machine. Super cute! Love all the embossing! Simply gorgeous!!!! Background embossing and that border punch is fabulous! Very cute! Love the clean design and your image is colored beautifully. So sweet Stephanie! 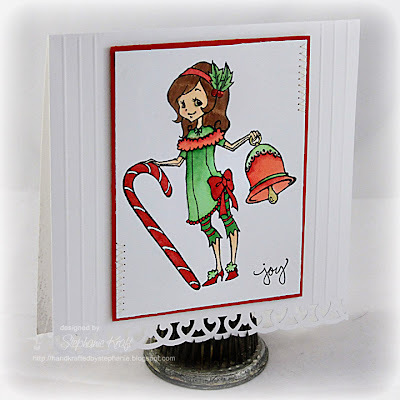 The embossed white background looks great with the festive lil' beautifully colored image!